Beomaster 1500 was the smallest model in a group of three, in which the basic designs were scaled to produce different models to fit into various price and performance bands. The complete line-up consisted of the Beomaster 1500 (25W), the Beomaster 2200 (40W) and the Beomaster 4400 (75W). There were many derivatives of each, most of which were in the form of music centres with either record players, tape recorders, or both. These three ranges were visually distinctive but shared much common technology, and each gave good performance and offered good value. Text copyright © Beocentral. Unauthorised reproduction prohibited. The Beomaster 1500 was an AM/FM receiver offering 2x25W, 4 FM pre-set stations and two sets of switchable loudspeaker outputs. It effectively replaced the Beomaster 901, a long running and popular model, but added more power and more facilities to make it even more attractive. For the first time in a Beomaster, LED indicators were used on the front panel, in this case to indicate FM tuning balance, AM signal strength and FM stereo reception. Another welcome improvement over the Beomaster 901 was that the power amplifier was directly coupled to the loudspeakers, improving the damping factor considerably which in turn led to a tighter and cleaner sound. Another improvement over the Beomaster 901 was that the headphone socket was finally moved to the front panel instead of being inconveniently placed at the back. The socket no longer included a switching function as both pairs of loudspeakers were controlled by pushbutton switches. Text copyright © Beocentral. Unauthorised reproduction prohibited. The slim keys of the Beomaster 901 were replaced by square recessed pushbuttons which controlled most of the amplifier and tuner functions. An addition here was the ST or “silent tuning” mode, which muted the tuner unless a strong FM station was being received. Text copyright © Beocentral. Unauthorised reproduction prohibited. A complete system could be assembled around the Beomaster 1500, by adding a Beogram 1500 turntable and a Beocord 1500 cassette deck. 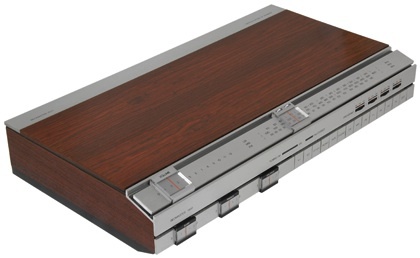 Despite similar numbering, none of these items matched each other properly, and a more sensible choice would have been one of the Beomaster 1500 based music centres, the Beocenter 2800 (record player), Beocenter 2600 (cassette recorder) or Beocenter 4600 (both sources). Recommended loudspeakers would have been the Beovox S 25 or S 30. Text copyright © Beocentral. Unauthorised reproduction prohibited. After the Beomaster 1500 was deleted, its position was not filled in the range for some years. Eventually the Beomaster 1700 would offer a similar package at the entry level position, but strangely this model reverted to the old AC coupled amplifier format, hardly a step forward. Text copyright © Beocentral. Unauthorised reproduction prohibited.